While many see Nintendo as a phenomenal gaming company, the company itself looks to extend its presence as a complete entertainment provider. In a bid to do just that, it is not limiting itself to just upgrading its existing products and offering new consoles but trying to bring the old into the new. A case in point is the Nintendo Wii. 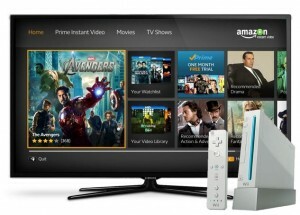 We’ve recently heard that Amazon’s Instant Video service app will also be available on the Wii. This means you can watch 140,000 movies and TV shows without having to upgrade to the Wii U. if you’re a prime member, you can watch a large number of the videos- close to 33,000- at no extra cost. Amazon’s move is interesting given that Nintendo announced a whole lot of streaming-video options for its Wii U console. The console would have video from Hulu Plus, Netflix and Amazon Instant Video, along with YouTube support. While there was a delay with the other services, there was no such delay in the case of Netflix. Members had full access within days of first announcement and had the chance to own the living room console with the GamePad, the controller that brought to mind, a tablet like device. This device will let users go through shows and movies as they are streamed from Netflix on the television. The whole idea was to extend Wii U’s functionality from gaming to that of a social platform. Called Miniverse, the platform is meant to provide hours of entertainment to users, keeping them engaged and enthralled. Apart from Miniverse, Nintendo also offers the Nintendo TVii, a free service that brings together streaming services, TiVo DVR and live TV all in one. The move was also meant to counter Microsoft’s own decision to bring over 35 more content partners to the Xbox 360. That means 200 million movies, shows and videos to the Xbox 360. The Wii and the Wii U will not be the only devices that will play Amazon Instant Video. You’ll also find it on devices like Sony Play Station, the iPad, players from Roku, Kindle Fire and the usual Blu-Ray players, set-top boxes and a whole lot of HDTVs. The Wii U is definitely a selling point for Nintendo, seeing how it is the first in terms of a full-fledged console. None of the other makers- Sony or Microsoft have made a model like this. With the Wii, Nintendo can look at capitalizing on an old favorite. The Amazon media streaming platform will also enable users to access cool features like Whispersync which lets you move from one device to another in a seamless fashion. You can move between tabs, it is easy enough with choices like Genre Recommendations, TV Shows and Watchlist. If you’re concerned about the kids, there’s a separate Kid Zone and Parental Controls to give you some peace of mind. The original Nintendo Wii enjoys wide popularity even today. Collaborating with Amazon will only enhance its popularity even further. Guest Author Gabbie has been writing technology related contents such as blogging, social media, gadget reviews and tutorials and making money online for more than four years now. She is currently working as a writer for Massbeacon where you can get details on FiOS offers and savings.